When I first got to know Jon and the gang at Arbor, he and they were making a lot of very good high ABV beer that eventually included some ridiculous stuff that I had the honour of designing the labels and pump clips for. 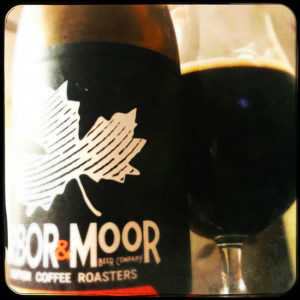 And Justin and the folk at Moor aren’t afraid of a big alcoholic hit either, and so this Imperial Stout brewed with coffee provided by the Clifton Coffee Roasters is an enormous boozy treat. Pouring an inky black with a tiny cappuccino head, the smell is coffee and prunes and India rubber. Taking a swig you’ll find a thick treacle tart, honey and plum jam malting along with a giant woody smoky black coffee smack. The hops are brittle and dry, bitter and zesty, with orange marmalade, lemon curd and hedgerow greenery adding some much needed freshness to the otherwise hefty dry sweetness of the malts and coffee. Add to this a rounded smoky whisky heat and you’re left with a beer that ends in treacle and bonfires, caffeine and Frazzles. 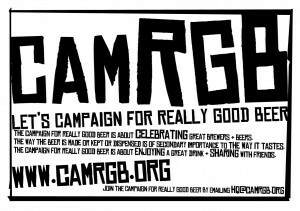 This entry was posted in Beer Review, CAMRGB and tagged 7.5% +, Beer, Beer Review, Bottle Conditioned, bottled beer, CAMRGB, Coffee, Drinking, Imperial Stout, Stout. Bookmark the permalink.